The F8F-1 Bearcat is a Rank IV American naval fighter with a battle rating of 4.7 (AB) and 6.0 (RB/SB). It was introduced in Update 1.33. The F8F-1 is an all-purpose light fighter-bomber, and excels as such. Although it may seemed incredibly outgunned with its quad M2 Brownings (even more compared to its 1B counterpart), the Bearcat can be a more than decent fighter in the right hands. 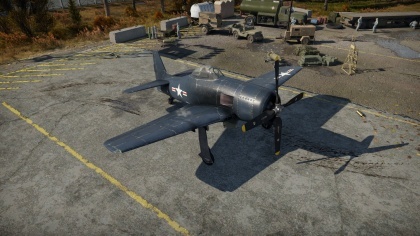 In War Thunder, the F8F Bearcat is an Era IV US Naval Fighter. 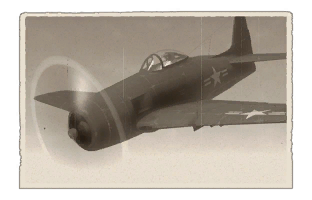 In game there are two versions of this particular model available – the F8F-1, armed with 4 .50 caliber M2 machine guns and the F8F-1B, armed with 4 AN/M3 20 mm cannons. The difference in armament is reflected in the Battle Ratings – the MG armed Bearcat has Battle Ratings about 1.0 lower than the version equipped with cannons has a Battle Rating above 6.0-6.3 in all game modes. The in-game Bearcat retains many advantages of the real-life counterpart. The F8F has very good acceleration and climb rate, thanks to its powerful engine. Because of that, it can quickly gain an altitude advantage over its opponents. Thanks to its high top speed, good wing endurance, and good energy retention capabilities, the F8F is perfectly suited to energy fighting using Boom & Zoom tactics. A Bearcat pilot should avoid low-speed dogfights, instead opt for a diving attack from above.The Bearcat is also a very hardy aircraft able to sustain several hits from enemy cannon and machine gun rounds before being decommissioned. The phrase "Grumman Ironworks" comes into play on the Bearcats just like their previous works; The F3F, The F4F Wild Cat, and the F6F Hellcat. Therefore you shouldn't be too wary of 13-15 mm. 20 mm Hispanos and 30 mm Rhein Borsig series guns are your biggest threats in terms of damage. The elephant in the room when it comes to the Bearcat is its 4 x M2 Brownings. With a relatively low fire rate and low damage, pilots must make their shots count. 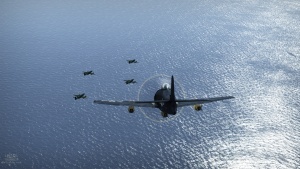 Unlike most other planes equipped with the M2 Brownings, the Bearcat can utilize M20 APIT rounds. These rounds excel at setting targets aflame. Precise aiming is key, specifically targeting the enemy aircraft's engine or pilot. Aiming for the fuselage is less effective as unlike the P-47D, which has 8 x M2s which can chew through aircraft hulls by hurling twice as many bullets down range. Meanwhile the measly 4 x M2s Bearcat will pepper the hull and simply be absorbed. Make use of the secondary payloads as well. The Bearcat can make use of the Tiny Tim rockets as well as a large array of rockets and bombs. Tiny Tims are especially useful against heavy ground targets and tanks. Unlike its big brother, the F8F-1B, the 1 has a far lower climb rate. However, it still possesses its light airframe, which makes turn-fighting and dog-fighting a breeze. Unfortunately, the F8F-1 is a rather weak Boom & Zoomer due to its less than effective armament. A high speed swooping attack has to be completed with utmost precision; otherwise, you will do no damage and will attract the attention of planes with far stronger weaponry. Once at high altitude, one can Boom & Zoom weaker planes. The fantastic acceleration, dive speed, and energy retention make the Bearcat one of the best energy fighters in War Thunder. Compared to its brother, the 1B, the 1 is a far more challenging fighter to fly. Keep in mind the good roll rate of the Bearcat, as well. Use this when evading opponents. Low speed, low altitude fighting is not a strength of the Bearcat. It is best used within altitude ranges of 4-5 km. The "holy trinity" of flight performance upgrades: Compressor, Engine, and Engine injection. All three combined increase climb rate by 10 m/s (~2000 feet/min). "Hunting made two cards": F8F vs. He 162 "Never fly alone" "big brother"
This page was last edited on 16 March 2019, at 09:18.